I have spent the last 12 days on a cruise with some older people and it occurs to me that telomerase is part of the problem of aging. That may come as a surprise to many of my readers – let me explain. Good cellular ecology requires excellent genetic copies, preservation of those copies, and destruction of damaged stem cells. 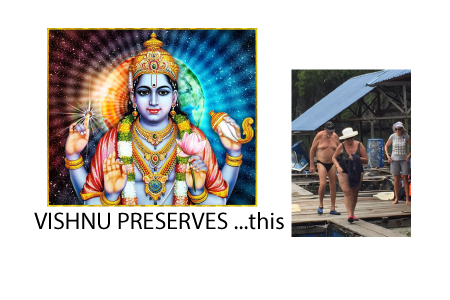 As I explain further in this blog about creation, maintenance, and destruction, telomerase is what enables the second Hindu diety, Vishnu the maintainer, to function. In our 20’s, before accumulated DNA damage from mutation, whether from replicative senescence (aka telomere shortening leading to DNA breaks), toxic mutation, or other means, telomerase is a good thing. In our 60’s, after stem cells are mutated, telomerase may be helping to maintain damaged stem cells. The good news is that taking TA-65 has a clinical effect of ushering in some apoptosis in my experience. For instance, my visceral fat loss and the newly spouted 112 yo black hairs of my former patient. It is interesting that low levels of radiation are healthy because they cause destruction and that possible clears marginal stem cells. Some people who take chemo report better hair and skin after recovery, again suggesting that clearing damaged stem cells, as long as there are replacements that are better, can be helpful. Lord Shiva, the destroyer never sleeps and manifests as the general term of apoptosis which is really a myriad of many self-checking functions of every cell that constantly keep us from accumulating problems. In the future, younger people will benefit from telomerase activators and older people will use banked stem cells for younger replacement parts. But all people can benefit from the creative destruction of apoptosis or cell suicide. Luckily, just as “rust never sleeps”, neither does “altruistic suicide” of cells. On balance, I have seen net positive changes from TA-65 because it appears not just to keep zombie cells alive but to assist in self-destruction where appropriate. Presumably, if it had an anti-apoptotic effect, we could even see more rapid aging instead of clinical stabilization owing to the accumulation of mutations and a more rapid evolution into chimerism (becoming one creature with many genotypes in our cells). Have you had noticeable results? Perfection is a transitory goal. How do you feel in all of your bodies? The physical, mental, emotional and spiritual? TA-65 gives you a mental boost that could be labeled confidence. This may be hard to measure but is instantly felt. For this reason alone I urge those that can afford it to take TA-65. Your immune system will be more resilient. Create something with your last grains of sand.